The sire of Meinens JetSet D is the renowned dressage stallion Zirkoon. His dam is the “keur-preferent-prestatie” mare Escansan who appeared many times in the showring and achieved many winning places. Meinens JetSet D made, during the stallion competitions 1998-99, one of the most striking appearances in the dressage ring. The elegant combination which he made with his rider Nathalie Smeets has left behind them a great impression, and they won four out of the six competitions with the highest score of 73%. On top of this, the combination was NBVR winter champion of 1999. After that, Meinens JetSet D was introduced successfully at Prix St. George level with Susanne de Klein. The offspring of Meinens JetSet D are doing exceptionally well both in the showring and in the sport. In 2000 the filly Thelma (Meinens JetSet D x Hemmingway) was awarded first place at the Havikerwaard Foal Promotion Prizes. In the group of four to five year old mares with foals at foot, Otina (Meinens JetSet D x Variant) was first in Veghel. At the Central Keuring, Gorredijk awarded Navratilova (Meinens JetSet D x Rivaal) first place in the Pavo selection for five year olds. In the final of the Pavo Cup she was sixth. In 2002 Mr. A. (damsire Ferro) was awarded first place in the Pavo Cup selection in Utrecht. The highest-priced foal at the auction in Maren Kessel was Tornado (Meinens JetSetD x Aktion). During the KNF Indoor Championships Dressage 2001 in Ermelo, Navratilova was reserve champion in the Z1 category with Christa Laarakers. 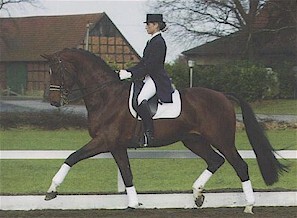 At the world championships for young dressage horses in Verden 2001, Meinens JetSetD had two of his offspring selected. In the five year old category there was Olando (damsire Rinaldo). In the six year old category there was Navratilova (damsire Rivaal). JetSet D's sons Jetstream W and J. Orlando were approved by the NRPS. At the pre-selections at the stallion show 2001/2002 a son showing jumping ability (damsire Zeoliet) was selected for the 2nd phase of inspections. At the pre selections at the stallion show 2002/2003 a son showing very good movements (damsire Cocktail) was selected for the 2nd phase of inspections in en Bosch. Meinen's JetSet D is a stallion with a great future.